I have been asked to write on death and dying. Since I am dying, according to my doctor (within a few months or years! ), it seems fitting for me to do so. Thank you for coming today and showing your love and respect for my father, Rousas John Rushdoony, and for celebrating his entrance into eternal reward. In 1915, our parents along with my mother's sister, her husband and son, Edward Esajian, were alerted to leave their home, Van, and the country, Turkey. If asked to compare Rousas John Rushdoony to a character from Scripture, it would have to be Ezra. Ezra, like Rush, came from a line of priests. 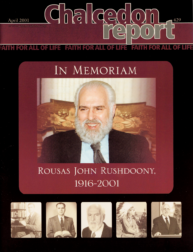 Late this past Thursday evening, Rousas John Rushdoony, founder and long-time president of the Chalcedon Foundation, was ushered into His Lord's presence after several months of rapidly declining health. I have no claim to scholarship. I was never his disciple, nor could I afford being a patron. For heaven's sake, I was not even a Christian. Yet, I was proud to share forty years of friendship with the great Christian scholar and charismatic spiritual leader, Rousas J. Rushdoony. On Thursday, February 8th, 2001, R. J. Rushdoony, potent Christian scholar and prolific author, president and founder of the Chalcedon Foundation, passed from this life to the next. A world without Rush is going to be a very barren and sad place for those of us who knew him and loved him. By John B. King, Jr. In the modern era, many churchmen lack a practical bent. 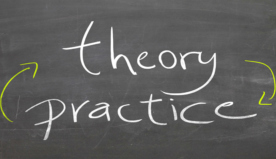 Because they do not understand the world, their theology is little more than pious gush devoid of practical application. The expelled "ughs" that accompanied my pushes didn't make the wheelbarrow hoe-er work better. I saw its claw-like teeth dig into the dried soil, but the Nevada sun had insured its near rock-hard solidity. The Duck Valley Indian Reservation is located on the Northern border of Nevada. The community where the Agency and other businesses such as the Post Office, school, hospital, and two stores are located is named Owyhee. As a Christian Reconstructionist pastor, teacher, and author, I am deeply grateful for the life and ministry of R. J. Rushdoony. About ten years ago, a banquet was held honoring R. J. Rushdoony and his wife, Dorothy. It was an affair fit for a king, held in a luxury hotel in Naples, Florida. R. J. Rushdoony was my spiritual father and my most important teacher. When I reflect on Rousas Rushdoony, I am reminded of how the apostle Paul identified himself to the church at Corinth: "Although you have countless tutors in Christ, you do not have many fathers" (2 Cor. 4: 15-16). My heart is overwhelmed with gratitude to the living God for what He has done in my life through you. There is not a week that goes by that I do not praise God for you and your ministry. I thank my God every time I remember you, Philippians 1:3. My father wrote on just about everything. As I sat beside him on the morning of his death, I was recalling an article he had written in 1982 entitled "What Ever Happened to Deathbed Scenes?"